When I first started making videos and uploading them to YouTube, I did not think much about how viewers made their decisions to click on one of my videos instead of one posted by someone else. In an Internet search, several videos may be suggested. People often decide on which one to watch based on the thumbnail image. One way to make your video stand out to viewers and tell them that your video is what they want to watch is with a custom thumbnail. An eye-catching thumbnail is an easy way to attract viewers to your YouTube videos. If you’ve gone to the trouble of making a great video, then you shouldn’t hesitate to spend a bit more time to make sure people notice your video and decide to watch it. In a new tutorial (see player window below), I show how to design and create a custom thumbnail in PowerPoint and how to attach it to your YouTube video. Although Photoshop or Illustrator can be used for crafting the thumbnail image, many people do not have this software or do not know how to use it. In this tutorial, I use PowerPoint, which many people are familiar with, to create a custom thumbnail. Moreover, if you create a thumbnail template in PowerPoint, you can use it to quickly create thumbnails for all your videos. But first, let’s go over some important information to help you design the best custom thumbnail for your video. A thumbnail is a small image, often clickable, created for a webpage and that represents a file such as a photograph or a video. When someone conducts a search for a video, the thumbnail gives the viewer a visual preview of what your video is about. Some thumbnails stand out more than others. These are custom thumbnails. When you upload your video to YouTube, you are presented with three random frames from which to choose a thumbnail. Now, these are totally random, which means you basically get to choose among three really bad choices. Obviously, being able to create a custom thumbnail that best represents your video is preferable. Who is eligible to use custom thumbnails? Some forums suggest that you must become a YouTube Partner to enable advanced options like custom thumbnails. This is not true; if your channel is verified, you then become eligible to upload custom thumbnails. This option became available to me as a YouTube video creator in late 2013. Since then, crafting a custom thumbnail has become a routine part of my workflow when making a video. I consider it a key part of the process in creating an effective video and actually enjoy the challenge of finding just the right image and text design to use in the custom thumbnail. What factors should be considered in designing a thumbnail? First, take a look at other thumbnails for your topic and see what other video creators have used. Although this review will give you some ideas for crafting your thumbnail, you also want to take note of the features most often used and think of new ones to use for your thumbnail. In other words, you should try to design a thumbnail that stands out from the crowd. Second, select an image that best represents your video. This image should be distinct but not misleading. Images featuring a person tend to attract the eye. If you can also show that person doing something related to the topic of the video, then your thumbnail image will be informative. 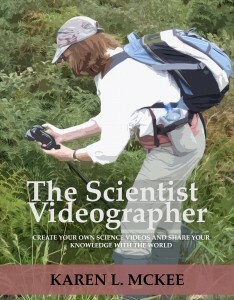 For example, if your video is showing a scientific method, a photo of a person using an instrument or demonstrating the method is what you want. Those thumbnails featuring an image of a person jump out at you, which is why many people use them. However, you can also feature a photo of an instrument, an organism, a landscape, or a graphic—assuming it has something to do with the topic of your video. Planning ahead for the thumbnail and getting that photo while filming is the best approach. Failing this, you can extract a freeze frame from your raw footage. I show how to do this in the tutorial. Third, resize and crop your image to ensure a good quality thumbnail that also meets specifications suggested by YouTube. In general, follow the rule of thirds to create a more interesting visual but mainly to allow space for text. YouTube suggests an image size of 1280 x 720 pixels, which is a 16:9 aspect ratio. You should keep the file at 2 MB or less and in an acceptable format such as jpg or png. Fourth, add text to your video, which informs the viewer and reinforces what the video is about. Include keywords that people will use in their search. In many cases, all you need to do is restate the title of your video using a larger font and colors that make the text stand out. Fifth, strive for a combination of an informative image and eye-catching text. In the tutorial below, I show some examples. You can make things easier on yourself if you use an image with some blank space in it, such as the sky, a solid fence or wall, as background for the text. In the tutorial, however, I show how to deal with a busy background. What software should I use to create a custom thumbnail? If you want to create a thumbnail from scratch, you have a number of options, including Photoshop, Illustrator, or PowerPoint. I’ve used PowerPoint in this tutorial because it’s a program that most science professionals use and are comfortable with. Photoshop and Illustrator are a bit more challenging to use and require some training and practice to use effectively. There are also online design sites that will assist you in creating a thumbnail. Canva is one example of a graphic design site, which offers templates and a user-friendly interface. I’ve not tried it, so can only recommend it as a possible site to check out. Although advertised as a “free” application, access to some key options seems to require a monthly subscription. In the end, you should use the software you are most comfortable with. I’ve given many presentations at international conferences as well as seminars at foreign research institutions and departments. One thing I learned from these experiences was that non-native English speakers appreciated it when I made an effort to aid their comprehension of my language. In addition to speaking slowly, I would add a single sentence on each slide that summarized what I was describing on that slide. This approach helps because people often can read English better than they understand the spoken language–especially if the speaker has a strong accent. I know that adding extra text to slides is often discouraged by presentation gurus, because the audience’s attention is split between reading the slide text and listening to what the speaker is saying. However, the advice not to add extra text to slides falls down when your audience is struggling to understand your spoken words. You have to balance the design of your slides with your audience’s needs. That experience in giving presentations to international audiences made me acutely aware of how captions can increase an audience’s comprehension of my material. In this blog post, I’d like to talk a bit about why and how you should add captions to your videos. When people first start making videos, they often focus on the audiovisual aspects of the project and don’t think much (if at all) about providing closed captioning text. It’s an extra step that many video makers avoid because it takes time and because they haven’t thought about the makeup of their potential audience. People typically think about closed captioning as mainly helping viewers who are deaf or hard of hearing. However, there are probably many more people who simply can’t understand the language being spoken in the video but whose comprehension would be improved enormously by captions. If you post your videos on a media-sharing site such as YouTube, your potential audience is the entire globe, where many people may not speak your language. For example, about half of the viewers of my videos on The Scientist Videographer YouTube channel reside in countries in which English is not the primary language. YouTube uses speech recognition technology to produce an automatic transcript for each uploaded video. It’s not perfect, but is pretty good; the few mistakes can be easily corrected. You can alternatively upload a text transcript, and YouTube will synchronize the text with the audio. Then, all a viewer needs do is click the “CC” button to turn on closed captioning. Captions help viewers who struggle to understand your spoken language but can read it. Another reason to include captions is because YouTube provides the option to translate the captions into more than 60 languages; however, this works only if the video creator provides captions. This means that those viewers who don’t speak or read your language can also watch and understand your video. A final reason is that a text transcript contributes to Search Engine Optimization by providing information to Google and YouTube that allows more efficient indexing of your videos. By ensuring your videos are discoverable by search engines, you will reach a much larger audience. Adding captions to your videos thus increases your global audience as well as the discoverability of your science videos. So part of my workflow in making a video includes preparing a word-for-word transcript of everything audible in the video. Because I often develop a script prior to filming, I usually can use that text file and only have to revise it a bit to reflect minor changes in the final film. That transcript file is uploaded, along with the video, to my channel, and YouTube then automatically aligns the text with the audio. When the video plays and the viewer enables the closed captioning (cc button), the text then appears on screen and is timed to match the audio.